Norway has used its considerable naval power to control the Isle of Man and Orkney Islands for many decades now and has only recently shown interest in establishing a greater presence on the Scottish mainland. While King Haakon remains in Norway, dealing with issues at home, he has placed his son Magnus Haakonsson in charge of the war effort in Britannia. 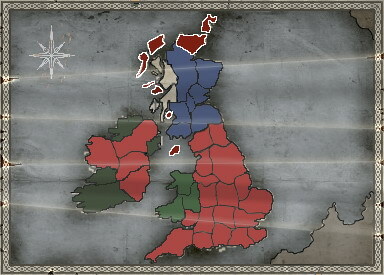 As the Norwegian people look to establish a foothold on the British mainland, they may choose to adopt their traditional naval raiding approach of surprising and sacking poorly defended settlements, before returning to the ocean as quickly as they appeared.Scotland is Norways first obvious target for expansion, however it may be in their best interest to assault the east coast of England or Northern Ireland, as the factions in these regions will surely be distracted with their own war efforts. Nomadic warriors recruited for their natural ability with the axe. Trained soldiers from Gotland, effective even with their outdated armour.